Long-Life Seafood Processing Blades withstand harsh conditions. Available in sizes from 3.54–11.811 in. for both fresh and salt water processing, stainless steel Hyde IBS Seafood Processing Blades feature smooth Ra microfinish coating. This reduces friction during cut, tendency of fish and waste products to stick to blade, and wasteÂ while also helping to extend blade life. Polished and honed edge delivers sharp, clean cuts. In testing, after 500 hr ofÂ constant salt spray test (ASTM Standard B117), blades showed virtually no rusting or corrosion. Southbridge, MA – A new proprietary process that places a low or “smooth” Ra microfinish coating on blades providing excellent corrosion resistance to the conditions found in seafood plants has been developed by Hyde Industrial Blade Solutions (IBS), a division of Hyde Tools, Inc. Hyde IBS Seafood Processing Blades are designed for both fresh and salt water processing and have been tested extensively in land-based plants and ocean-bound ships. Engineered with high-grade stainless steel, Hyde applies a smooth Ra microfinish coating on its seafood blades to reduce friction during the cut and the tendency of fish and waste products to stick to the blade. 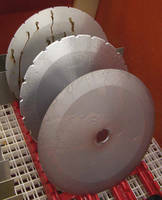 Cleaner blades last longer and cut more efficiently producing more yield and less waste. These blades also feature a super polished and honed edge to deliver the sharpest and cleanest cuts. In testing, after undergoing 500 hours of a constant salt spray test in accordance with ASTM Standard B117, Hyde IBS Seafood Blades showed virtually no rusting or corrosion. While most plants clean and sharpen their blades every 2 – 4 shifts, this test lasted the equivalent of 62.5 shifts or nearly 21 days of constant use without breaking down. Fewer work stoppages for blade sharpening or changeovers means less downtime on production lines and increased productivity. Hyde IBS Seafood Blades come in different sizes ranging from 3.54” (90 mm) to 11.811” (300 mm) and cover the most commonly used processing machines. The manufacturer offers helpful charts providing Original Equipment Manufacturer (OEM) part numbers cross-referenced with Hyde’s designations to assist users in selecting the correct blades for their processing machines. Celebrating its 140th year of serving customers, Hyde Industrial Blade Solutions is a leading producer of industrial knives and blades for a wide variety of markets including food processing, cloth and textile and leather, hose and tube, tire and rubber, package converting, paper and packaging and abrasives as well as for general industrial applications. Hyde Tools, Inc. is the largest manufacturer of industrial machine and hand knives and tools for remodeling, restoration, building trades and do-it-yourselfers in North America. Clamp-On Snow Blades turn tractors into snow removers.